Talk Thai to me anytime and I am happy camper! I love the cuisine that evokes all savory, sweet, spicy and sour flavours and harmonizes them on one plate. Most Thai restaurants here are pork free so when I heard of Surisit, The Thai Kopitiam who serves pork in their Thai cuisine, I was ecstatically jumping with joy. Surisit first outlet in TTDI was a smashing success and has gathered quite a following for their dishes. Owner Rivon Gill has recently opened the second Surisit in Paramount area, Petaling Jaya to bring Surisit’s home-style Thai cuisine to the neighborhood. With our ravenous stomachs in tow, we paid a visit to the newest outlet for a taste of Surisit. 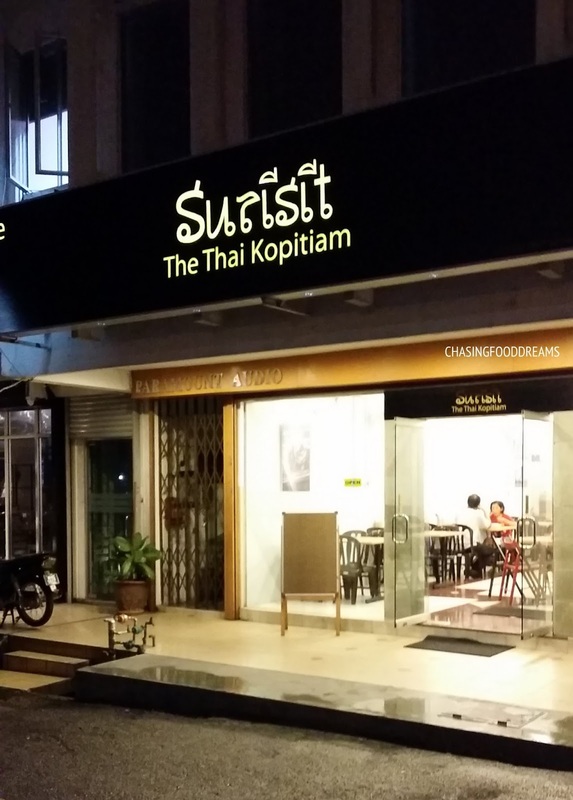 The outlet is dressed with minimalist and focus more on the rustic home-style food through a kopitiam concept. It is still bright, clean and neat so it’s a good sign that the owner chose to let their food shine in this simple no-frill kopitiam. The menu is quite extensive and many dishes are familiar while some looks to be really authentic plus there is quite a delicious list of pork dishes which I am dying to try. We had quite a good choice of dishes for the seven of us that evening. Thai Otak Otak (Hohmuk Paphraw) is served in a coconut shell and looks pretty yum at sight. It’s got seafood steamed in a spice laden thick custard sauce. It’s got a good balance of spices and coconut cream, rendering lovely savory and moreish flavours with some heat. The seafood is nicely cooked too with pieces of tender coconut flesh as well. Though it didn’t won our hearts, the Prawns Fried with Long Beans & Thai Shrimp Paste (Thaw Fahgam Phat Khapi Kung) was still sufficiently decent with its just cooked long beans and bits of onions with prawns in a piquant Thai shrimp paste sauce. I love Thai salads, any for that matter of fact because I love the distinctive flavours and textures. One of my all-time-favorite Thai salad has to be the Catfish Mango Salad (Yam Pla Duk Foo Ma Mung). This one is very satisfying with lots of flavours and textures in tow. The mango salad is fresh, vibrant and filled with lots of sour and sweet notes while the crispy catfish and cashew nuts gave the salad lots of crunch factor. Crispy Fried Pork with Shrimp Paste, Kaffir Leaves & Chilies (Moo Thod Kapi) is superb in my books. Well-seasoned pork with bits of fats is beautifully savory and moreish. I tasted the distinctive shrimp paste taste and thought this dish is pretty much lethal as the pork slices are very addictive. Pork is moist and tender too. The deep fried kaffir leaves added aroma to the pork. Super shiok! The Fried Prawn Cakes (Thod Man Kung) is pretty good. Golden breaded prawn cakes have a good bouncy texture with sweetness from the prawns. It’s crispy and also tender. Dip these in the sweet Thai chili sauce and it makes great snacks. The next dish of Claypot Glass Noodle Prawns (Kung Op Woon Sen) came with fairly large prawns neatly arranged on glass noodles. Though it looked good, the glass noodles were a tad bland. The prawns were good though as they were firm and had a light sweetness. We still enjoyed this with rice. Thai-Style Deep Fried Squids with Salted Egg (Plamuk Phad Khikhem) rocks! These luscious squid are lightly battered and coated in a sublime salted egg yolk sauce together with some aromatics of onions, kaffir leaves, chilies and coriander. The dish has savory and sweetness all nicely balanced while the squid is pretty tender too. May not be good for the heart but so good for the soul… must order! I have always enjoyed this dish of Minced Pork with Thai Basil (Phat Krapao Moo Sap). It’s practically available in most Thai places and is comfort food. Minced pork is sautéed with lots Thai basil to create that distinctive aroma and flavour. The version here included onions, spring onion and chili in addition to the usual ingredients. It’s got lots of moreish flavours and is perfect with steamed rice and fried sunny side up egg. That’s what I usually order when I see it on a menu because it’s practically a meal all by itself. I hope I got the name for the beef dish right for Stir-Fried Beef with Chilies & Thai Basil Leaves (Neua Phat Bai Grapao). I didn’t see basil but instead saw it was crowned with kaffir leaves. The beef is flavourful and has a good firm bite. It is another dish that one can snack on happily. Surisit manage to nail their meat dishes with good dose of marinades and also kept their meat juicy and delicious. Our last savory dish was another classic Steamed Fish with Lime (Pla Nueng Prik Manau). The fish is smothered with loads of minced garlic, chili, coriander soaked in a pool of lime sauce. This one was less impressive than the other dishes as there seemed to be some kick missing in the usual sour and tasty soup. Nevertheless, it’s still a passable dish which just needed some tweaking of flavours in soup and the fish was fresh. I like Surisit for its no-frill Thai home-style kopitiam vibe. The menu is filled with a long list of Thai favorites and many are hits despite very few misses. Serving a list of Thai porky dishes is also another plus point. I am pretty sure many will be sniffing out this outlet soon following it pursuit of its popular TTDI outlet.